No journey is easy for the spacecrafts. The space presents the harshest of the conditions to these machines. NASA engineers are busy making their Orion spacecraft tough enough to endure them all. Orion is the next generation multi-purpose crew vehicle being developed by NASA for deep space exploration and the latest addition to Orion is the updated heat shield. The new 'coat' allows Orion to withstand temperatures over 2200°C. This new thermal coat is called the 'thermal protection system' and its main job is to protect the crew and internal systems against the intense heat generated during spacecraft's re-entry into the atmosphere. Engineers are busy updating the shield for Orion's upcoming Exploration Mission - 1 aka EM-1. This mission will aim at having Orion remain in space for about three weeks and make a re-entry at a faster speed and hotter conditions. John Kowal, who leads the thermal protection system for Orion, informs that this system is crucial for future missions. 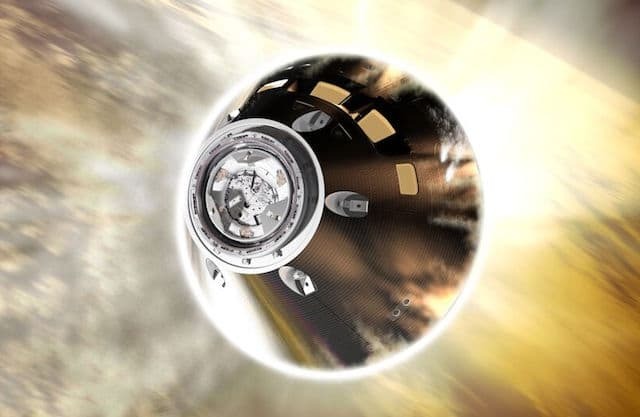 The design team used the knowledge gained from Orion's earlier flight to upgrade the heat shield. During its earlier flight, Orion re-entered the atmosphere at speed of about 30,000 ft/sec and during the EM-1 it's expected to enter at about 36,000 ft/second. It'd be important to note that even though the difference in the two speeds will be subtle, the heating will increase exponentially. The new coating will maintain the temperature ranging between -65°C to 287°C before the entry and also offer protection against electrical surface charges. Engineers have also reworked the manufacturing process of the heat shield. The approach has been to reduce the mass of the spacecraft. Engineers have opted to make the heat shield using about 180 blocks instead of a single monolithic layer. Read more about this update on official NASA blog, linked below. what if the forces in polygon law of forces are neither coplanar nor concurrent? sir, what is meant by EM-1? Orion's upcoming Exploration Mission - 1 aka EM-1. can u plz tell me why is the flywheel round in shape? I'd request you to read this: Regarding Content On CrazyEngineers | CrazyEngineers . Start a new discussion in the most appropriate section of CrazyEngineers (probably mechanical engineering) and add all the details like what you understand, what information you've collected so far and your specific doubt about any concept or idea.